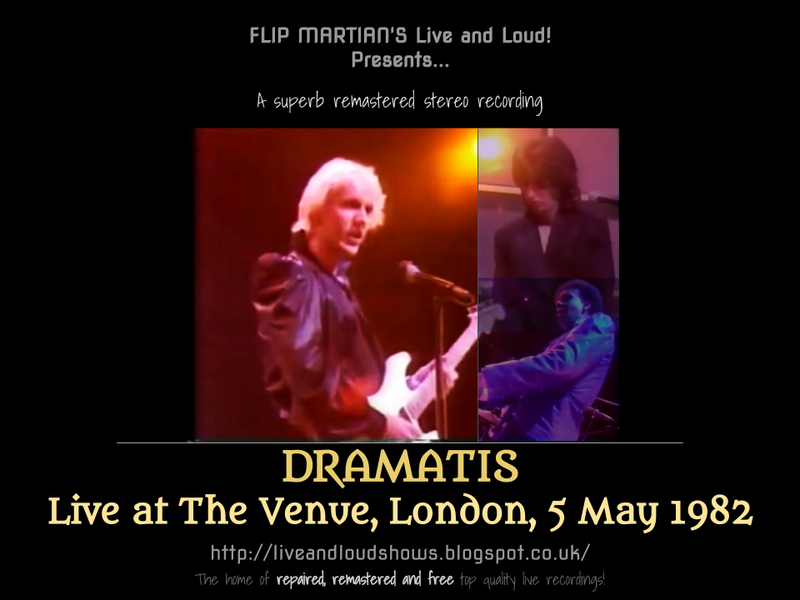 Dramatis were Russell Bell, Chris Payne, Ced Sharpley and Denis Haines - all members of Gary Numan's backing band from 1979-1981 and during 1981/2 were signed to Elton John's Rocket Records label, releasing 7 singles and an album. This is a remaster of an FM broadcast of excerpts from their live set from 1982 recorded at the BBC's Paris Theatre, in Lower Regent Street, London - they were a 3 piece at this point, with Haines having left after the album was released. I had a copy of this recording, taped off the radio back in the day which disappeared over the years. Many years later, I was able to replace it with an mp3 copy which really wasn't very good - very muffled and dull sounding but at the time I couldn't find better. I recently had a request to remaster this gig and upload it to Live and Loud! and I wanted to do better than resurrect my mp3 copy - someone must surely have a better source! So I asked around. Another copy was forthcoming which was much clearer but had a lot of hiss on it (unremovable amounts of it, in fact, as it turned out). But then! Someone got in touch who had a copy on cassette recorded at the time - and that was better still. Result! So after collecting it, I transferred it to a lossless audio file and got to work. It was a typical radio mix from the time - very flat, dry and sparse sounding. I removed the small amounts of tape hiss and spent much time putting it through a 30 band EQ to enhance the bass, drums and guitar and create space between the instruments (as per usual). I'm pleased to say it sounds much more punchy and clear now, with everything rather more "live". The one album released, For Future Reference is worth tracking down - its been released on budget re-releases a couple of times since 1981 credited to Gary Numan/Tubeway Army as "The Dramatis Project" among other names which does a big disservice to 4 great musicians, frankly. 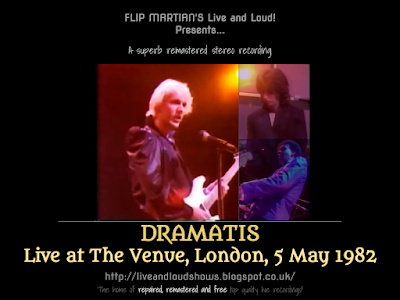 In more recent times, there were plans for Dramatis to reform and get their back catalogue rereleased - they have apparently regained ownership of it - but drummer Ced Sharpley sadly passed away a few years ago and it seems enthusiasm from the remaining members to continue has dissipated since. Which is a shame. So that leaves this - as sometimes happened with the BBC recordings, it wasn't recorded especially well but hopefully with what I've done its far more listenable now than it ever was.